Small or medium-sized companies that work on the integration of disadvantaged groups face significant shortages of skilled labour force. Such shortages mainly refer to technological progress and economic innovation. The INNO-WISEs project will tackle these weaknesses by improving the capacity of such companies enabling them to offer qualified jobs to disadvantaged groups. The project connects actors from work-integration social enterprises, research, technological experts and relevant public authorities. Together they will develop and deliver solutions for applying key technologies and managerial models to the social enterprise sector. The project will create a knowledge management framework, a flexible digital communication platform and training programmes. Through its activities, it will change the entrepreneurial mind-set, skills and attitude of the sector thus building and promoting a stronger culture of entrepreneurship and greater social cohesion. One year and half after the project’s implementation, the INNO-WISEs project partners gathered on the 24-25th of January in Ljubljana for their 4th project coordination team meeting. The main objectives of this meeting were to give a general insight into the work done, work together and exchange on specific items, and have a clear view on the progress that still needs to be done. For this meeting in Maribor, the project team considered the need for further discussing and meeting before the start of the implementation of the test phase and of the training programme related to the INNO-WISEs' ICT platform. It was also useful to close the activities linked to the conception of a technological and knowledge management model and framework within this ICT platform, and share the results reached. The meeting was hosted by MONG, Slovenian partners, in collaboration with the Association of Social Economy Slovenia. For its second project team meeting, INNO-WISEs partners gathered in Zagreb. The meeting was organised by the Institute of Social Sciences Ivo Pilar, project partner from Croatia. This project team meeting was the opportunity to showcase the project progress and latest achievement done in the framework of INNO-WISEs. As already announced, project team “INNO-WISEs” all gathered in Katowice (Poland) on the 17th & 18th January for our first project team meeting. Our Polish partner Stowarzyszenie Współpracy Regionalnej (SWR), association for Regional Co-Operation, received the leader partner – Fondazione Politecnico di Milano – and all the project partners during these two days. This meeting was important to give a general overview of the actual situation of the project but also to fix the next step for the project INNO-WISEs. It was also an opportunity to discuss and bring forward the first national and regional reports made in Lombardia, Croatia, Slovenia and Poland. The reports focused on integration social enterprises behavior related on managerial, marketing and technological aspects. 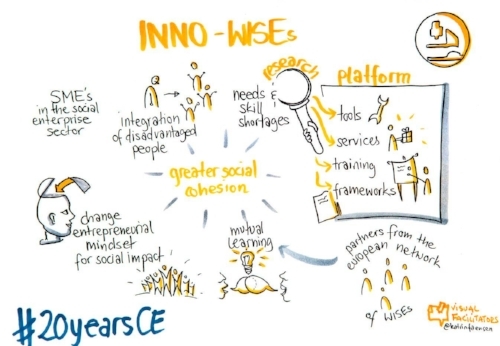 Those reports results will be used for the implementation of tools and activities in order to develop technological innovation capabilities and skills of WISEs and more specifically to enhance the statut of work integration social enterprises. The INNO-WISEs project has been selected to be presented during the 20 Year Anniversary Conference of the INTERREG Central Europe. The project, financed by the Central Europe Interregional program, aims at proposing ideas, models and services that can make social enterprises more innovative and competitive by reducing the existing technological and business gap and stimulating a switch in mentality.